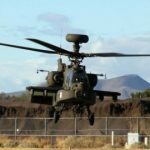 Boeing (NYSE: BA) has received a potential four-year, $667.5 million contract from the U.S. Army to deliver 24 AH-64E Apache helicopters and related equipment to Qatar as part of a foreign military sales agreement. The company will perform work in Mesa, Arizona, through May 31, 2020, under the fixed-price-incentive contract and the Army Contracting Command will obligate $136 million in funds at the time of award, the Defense Department said Tuesday. DoD said the FMS deal also covers 1 Longbow crew trainer, Thales-built radios and ground support tools. Qatar proposed a potential $3 billion FMS agreement in July 2012 to procure 24 Apache helicopters, associated equipment, logistics and training support from the U.S. government. The Defense Security Cooperation Agency identified Boeing, Lockheed Martin (NYSE: LMT), General Electric, Raytheon (NYSE: RTN) and Lockheed-Northrop Grumman (NYSE: NOC) joint venture Longbow as the prime contractors for the sale.